Here is the tabletop setup for the Spring Recruits Show. I changed it from 4 panels to 3 panels, making the table size now 4′ by 6′ in size. 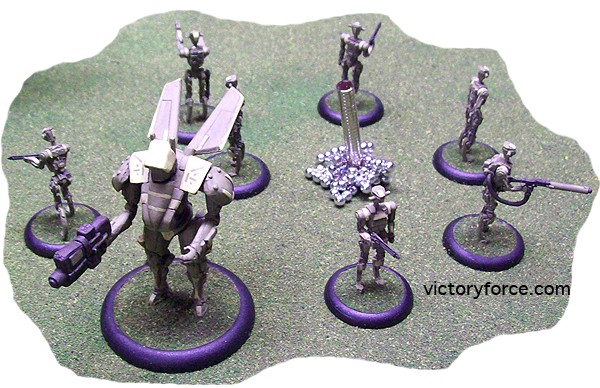 This size allows for the players to enter into combat faster, without time spent maneuvering. Since this is a Con game, I found this to be the route I wanted to take. The setup is simple and easy. The hedge rows, trees and other terrain features are simply placed around the table. The US and German forces are pretty equal in size. The twist to this game will be Sci Fi elements I am adding. The players will not only be battling each other, but they will also need to deal with a group of SATYR’s and a “Hopper”. I will let you know after Saturday how the players dealt with the situation.